There are some pieces of clothing I come across that are just..."out there". Pieces that seem just so fun for one-time wear (probably for some kind of themed costume event), then never show up to see the light of day again. 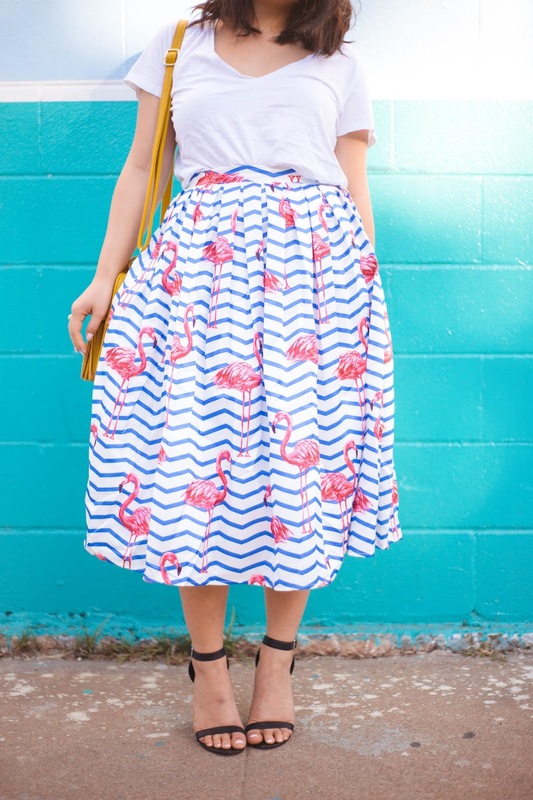 Exhibit A: this flamingo printed skirt. At first glance, it seemed a bit too costume-y and flamboyant, but when I thought about it some more, my heart just told me I had to have it. I love the challenge of making a fun, "out there" piece feel more wearable for the every day gal like myself. 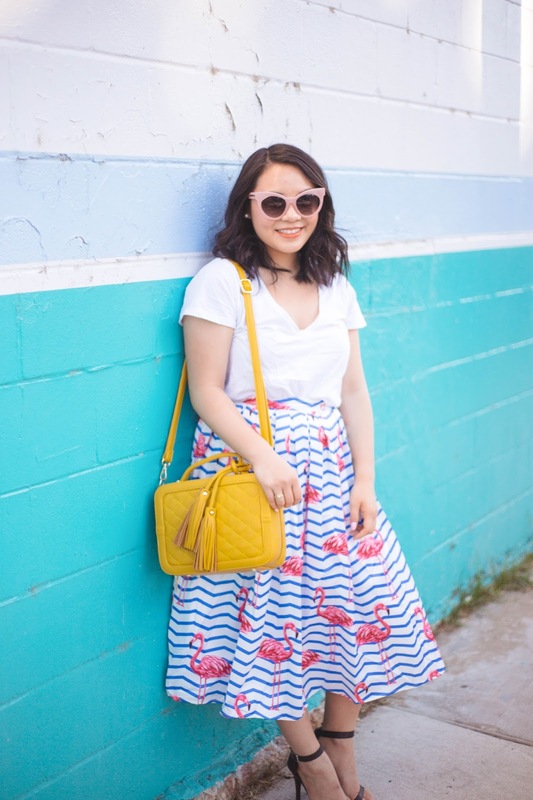 Here's how I did it with this skirt! 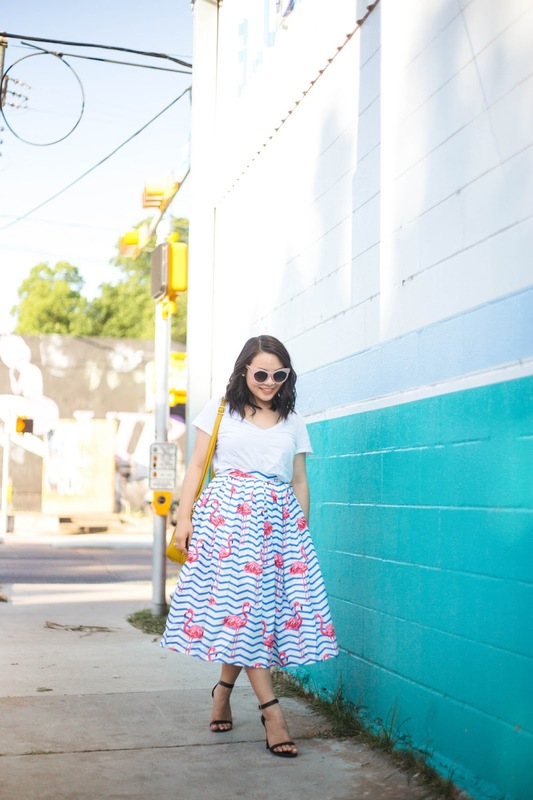 It's no secret I love a bit of color in my wardrobe, but when I saw this flamingo printed skirt, even I thought it was a bit out of my norm! 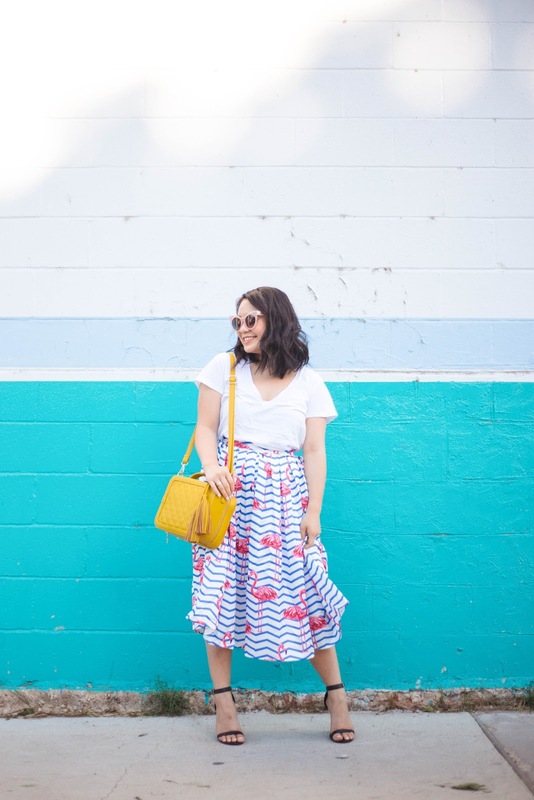 Statement skirts like these always seemed so fun to wear, but I could never justify such a purchase, since I thought I could never find an appropriate time or proper place to wear a statement piece like this. After a bit of thought, I realized I couldn't pass up the fun print. I bought it soon after! You know what I realized? No one really needs a "right time" or "right place" to wear something like this. If you feel like wearing something fun and crazy, you do it, sister! 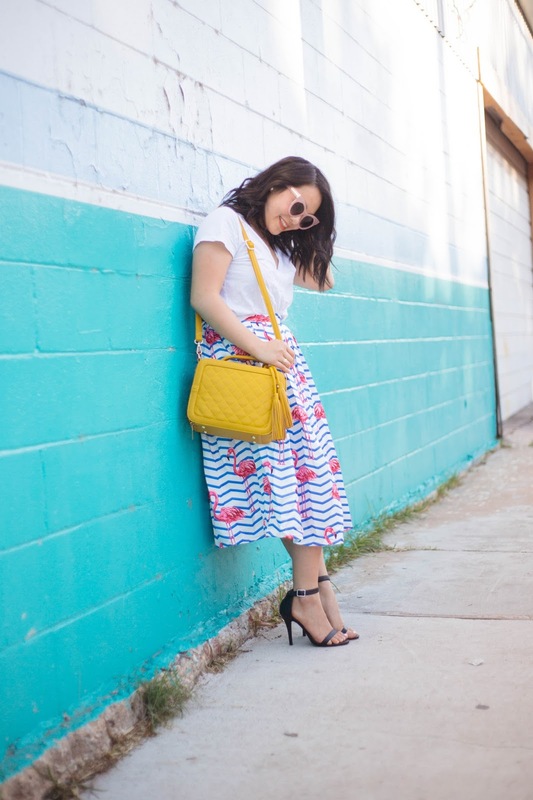 Pairing this statement skirt with a plain white tee and super simple black strap sandals felt most natural to me. 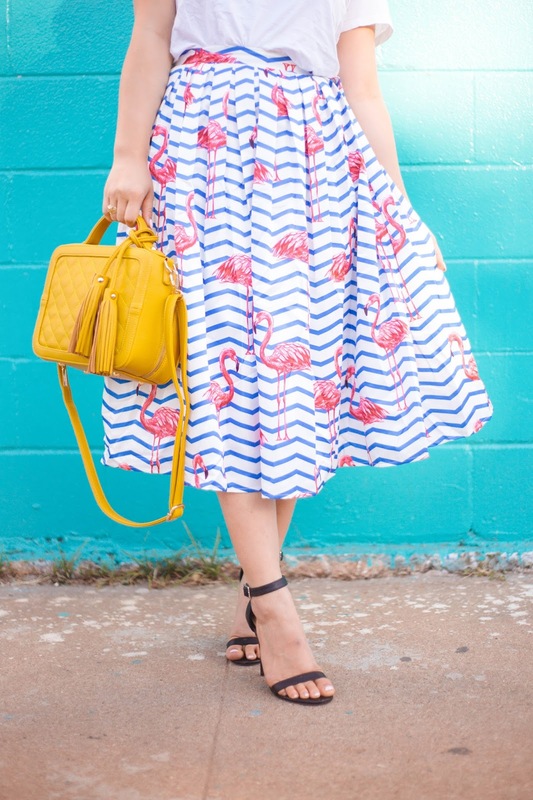 It's not overly dressy, but it's pulled-together, comfortable, and puts all the focus on the fun skirt! I don't even remember how many compliments I received the first day wearing this skirt. Strangers and friends alike asked me where I made my purchase, and it made me so happy to see that my choice of clothing that day made other people smile, too! Unfortunately, these babies are selling out fast, so be sure to hurry and purchase before they sell out for good! Speaking of clothing selling out, it's been a crazy week around here for me! Besides finishing up my third year of college and moving out of my dorm room (all by myself at that! 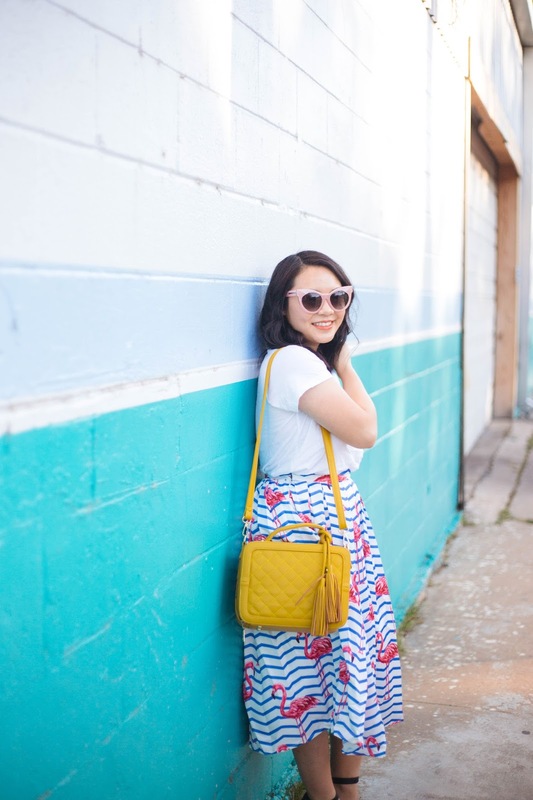 ), I hinted at quickly shifting gears to start my creative content internship at an amazing company I love and adore: May Designs! After a crazy turn of events in the past few months, I scored a dream of an internship with May Designs, and to put the last few days in a few words, it's been: nerve-racking, refreshing, thrilling, and exciting. One thing I've been loving so much about this internship is how work doesn't feel like work until I close my laptop and realize how tired I am and it's already time to go home! I'd love to tell you more about what brought me to this position in the future, but for now, it's been so fun learning the ropes and jumping into the craziest time of the year with #NationalNotebookDay today and the first events of Austin Fashion Week tonight! Stay tuned on my Instagram @sarah_thebella to catch the latest about my internship and tonight's Austin Fashion Week events! Thank you so much for making The Bella Insider a part of your day, and please do leave a comment below if you'd like to say hello! 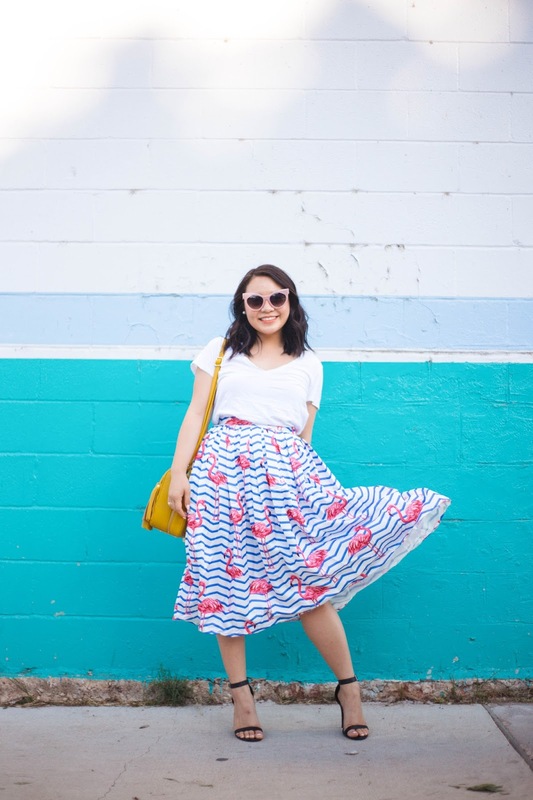 Such a fun skirt, Sarah! And totally agree to wearing what you like! Your internship sounds so fun. Looking forward to hearing more about it! 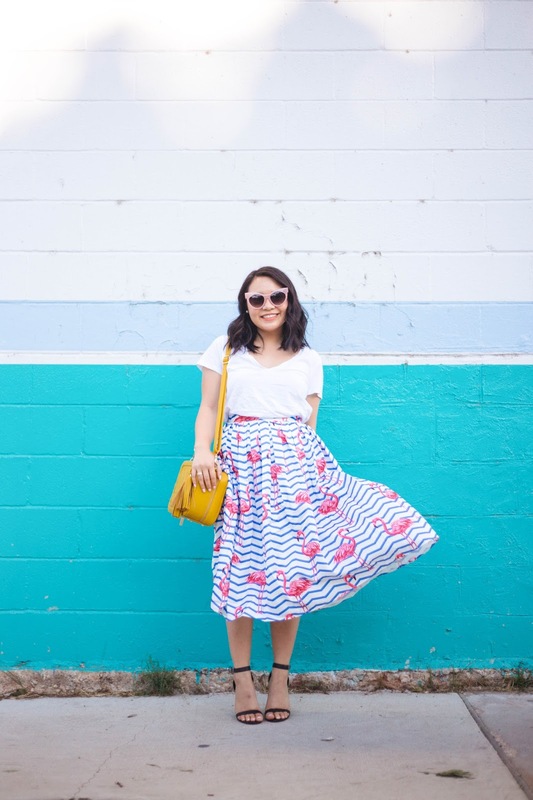 Oh my, how cute is that skirt?! 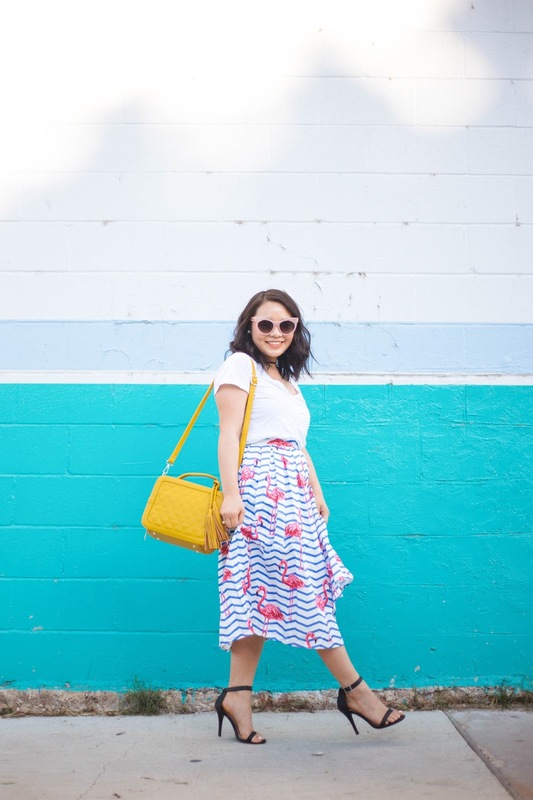 So fun and I love how you styled it. This website is also my favorite. You gave a statement about fashion. BUt your writing style is great. I need college essay writing help from you. I am waiting for your reply.